According to a new report, over the next 5 years, Australia’s economy will continue to be a strongly driven by Mining. According to forecasters, a switch to a more production-focused phase will raise the Mining sector's share of GDP. In fact, it is anticipated that by 2018, the mining sector will amount to 19.8% of Australian economy, which is a small rise on its 18.7% share at the moment. 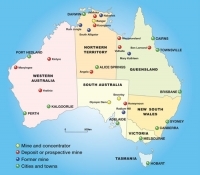 This is good news for people who want to migrate to Australia and work in the Mining Sector. Adrian Hart from BIS Shrapnel says it's clear the mining boom is not even close to over. He said that regarding the mining boom, it is perhaps fair to say that this is the end of the beginning and not the beginning of the end. He added that over the next 5 years, the strong push from mining production, led by iron ore and Liquefied Natural Gas (LNG), will more than outweigh the economic negatives from decreasing investment in mining which will flow through to manufacturing and construction. Last financial year, Mining production increased 8.8% to $151 billion. However, over the next five years, investment is set to go down by 20%. Mr. Hart says miners will go to great lengths to lower higher production costs caused by a high Australian dollar and lower commodity prices. He said that over the next five years, they expect employment in mining operations to increase 11% mainly in iron ore and oil and gas. The 2013 to 2018 report of BIS Shrapnel's Mining in Australia also predicts that exploration spending will remain strong.